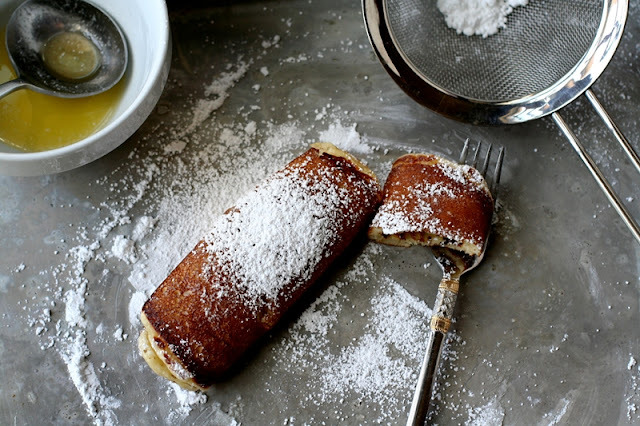 Start with lemony pancakes and add a little butter. 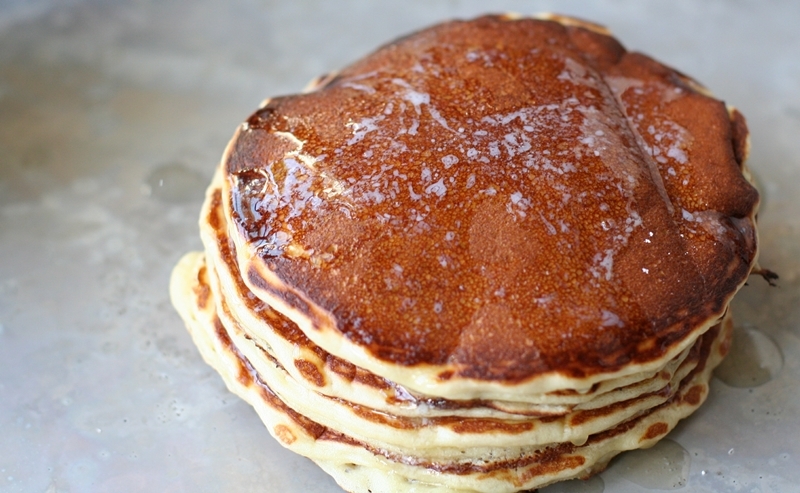 I love thin pancakes, like close to crepes, but just a little thicker. But I also like buttermilk pancakes and they are usually fluffy. These pancakes are fluffy, but they’re not cakey. And they’re lemony! You can add some nice blueberries or blackberries, of course. 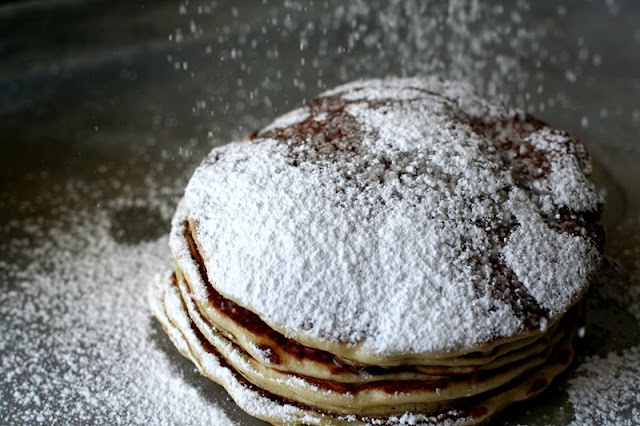 But, I love them with a little bit of melted butter and some powdered sugar. taking photographs than you might think. This recipe is adapted from one I got from my friend Krisi when she lived in Singapore. Krisi’s recipe used unflavored vegetable oil, so feel free to do the same if you wish. But, I bet you won’t after trying these. Combine first five ingredients; stir well. Combine eggs, buttermilk, and oil in a bowl. Add flour mixture, stirring just until dry ingredients are moistened. 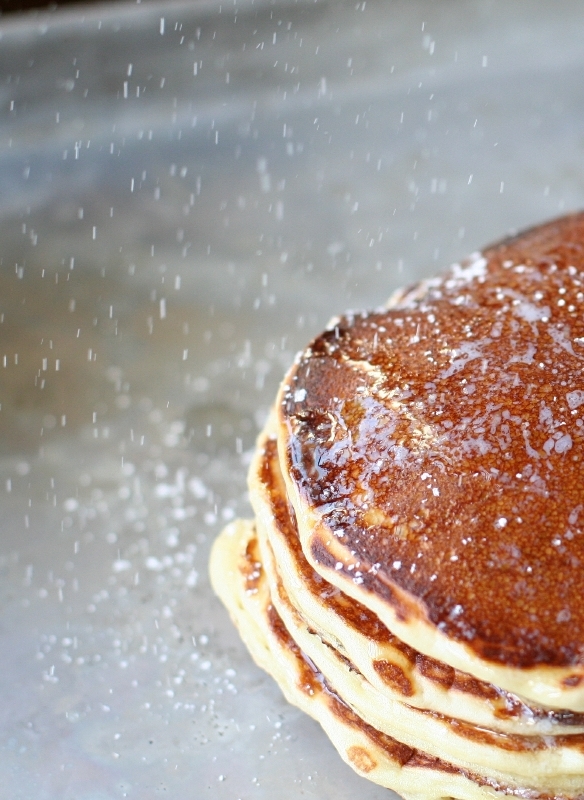 For each pancake, pour about 1/3 cup batter onto a hot, lightly greased griddle. Cook pancakes until tops are covered with bubbles and edges look cooked. Turn and cook the other side. These are totally out of control. I call them Blizzard Pancakes. Serve hot with a little melted butter and some sifted powdered sugar. You can store batter up to one week in fridge. Add a little milk to batter if too thick after storage. If you have any leftover pancakes, and I predict you won’t, you can freeze them in Ziploc sandwich bags with all the air pressed out of them, and then put all of the bagged pancakes in a quart or gallon freezer Ziploc. Reheat in the toaster. Thank you! I will pass along your site to the rest of the cooks in our group!